Experienced pilots sometimes get into trouble when dealing with the effects of density altitude. It's not that these pilots do not know what density altitude is, it's just that they become complacent. Remember ... Complacency kills! 91.116 (b) For any flight, runway lengths at airports of intended use, and the following takeoff and landing distance information ... other reliable information appropriate to the aircraft, relating to aircraft performance under expected values of airport elevation and runway slope, aircraft gross weight, and wind and temperature. 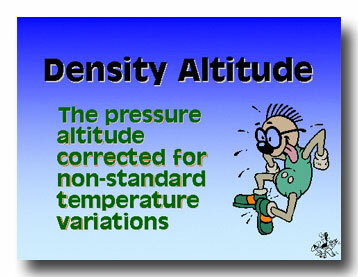 Density altitude is a term that sometimes causes confusion to the uninitiated. A high density altitude is NOT a good thing. 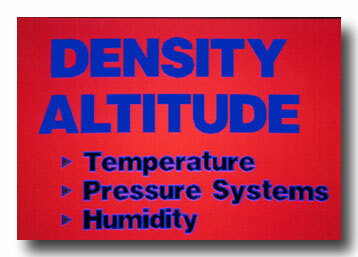 Density altitude is defined as the pressure altitude corrected for non-standard temperature variations. 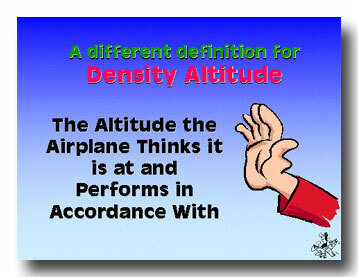 And while this is a correct definition, my definition is perhaps more appropriate: DENSITY ALTITUDE IS THE ALTITUDE THE AIRPLANE THINKS IT IS AT, AND PERFORMS IN ACCORDANCE WITH THIS COMPUTED VALUE. Suppose an airport is situated at an elevation of 3,000 feet. It is possible with a low pressure system and hot temperatures for this airport to have a density altitude of more than 6,000 feet due to the effects of the pressure and temperature. An airplane operating at the 3,000-foot airport on a day with a 6,000-foot density altitude would have the performance normally found when flying at 6,000 feet during a day with standard conditions. 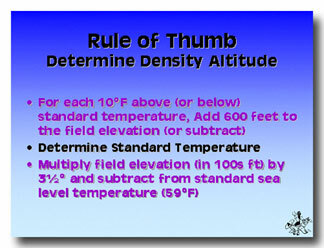 Density altitude can be computed on a density altitude chart, flight computer, electronic flight calculator or by rule of thumb. Density altitude gives us some idea about the expected performance of the airplane, but only if you apply the information to the performance charts found in the owner's manual or POH (Pilot's Operating Handbook). The DENALT performance computer has a "write-in" area for the sea level takeoff distance and rate of climb. When the temperature is aligned with the pressure altitude, it provides values that can be multiplied by the sea level takeoff and sea level rate-of-climb to predict the expected performance under current density altitude conditions. 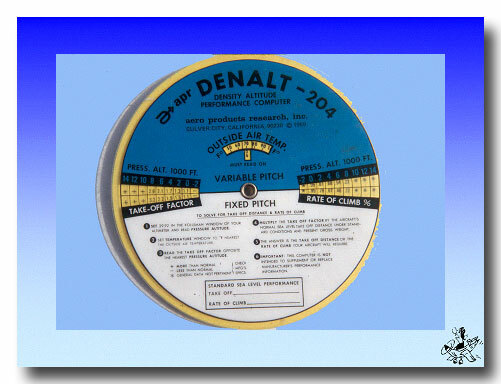 This special DENALT calculator has information for both fixed-pitch propeller or constant-speed propeller airplanes. The sea level performance can be written at the bottom. The temperature is selected at the top center, then the pressure altitude is selected along the center, to the left your will find take-off factors and to the right is a rate-of-climb percentage. 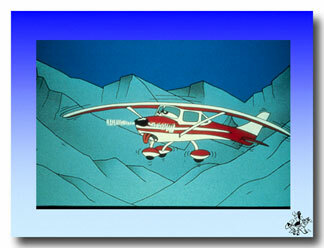 Multiply the sea level performance by the factors and obtain the expected performance of the airplane. Standard temperature at sea level is 59-degrees Fahrenheit. For elevations above sea level, subtract 3.5 degrees per thousand feet of elevation from the sea level temperature of 59 degrees. For example, at Jackson, Wyoming the elevation is 6,444. Multiply 6.444 times 3.5 for 22.55. Subtract this from 59 (59-22.55) for 36.45. The standard temperature at Jackson is 36.5 degrees. If the existing temperature is 80 degrees, subtract (80-36.5 = 43.5). Divide this difference by 10 degrees (for each 10-degrees F above standard), and multiply 4.35 times 600 (600 feet per 10 degrees) which equals 2,610. Add 2,610 to the field elevation (6,444) for a density altitude of 9,054. Under the existing conditions (of our example), the airplane will perform as it would on a standard day at 9,054 feet elevation. Density altitude not only affects the takeoff distance and rate of climb, but it also applies to the service ceiling of the airplane while flying en route. It may be possible to fly an airplane with a service ceiling of 12,650 feet toward mountains that top out at 10,000 feet, yet because of density altitude the airplane is unable to clear the mountains (unless you can find some anabatic or mechanical lift).